While I don’t have any houseplants per se, I do bring plants inside for the winter. A few are too sensitive to be outside year round (like the plumeria you see on the extreme right in the photo below), others simply do better protected from the cold temperature. I’m not above admitting that I play favorites, so the plants that are invited to be houseguests for the winter are typically the ones I’m particularly fond of at the moment. Houseguests for the winter. The light you see all the way on the left is an OttLite floor lamp my wife picked up for free on Freecycle.org. Others are recent purchases that I want to give a head start. The bulk of the agaves you see in the next photo are recent purchases from Arid Lands Greenhouses. They were shipped bare root and need special TLC to get reestablished quickly. After repotting them in a very loose soil mixture, I put them on a seedling heat mat like this one. The mat warms the bottom of the pots, thereby stimulating root growth. I lightly water these agaves once a week to simulate the kind of environment they might encounter outside in early summer, their peak growing season. This is the kind of treatment I gave the agaves I bought from Greg Starr when I visited him in Tucson, AZ in early December. I planted one of them, an Agava bovicornuta × colorata hybrid, in the driveway succulent bed a few weeks later, and it had a healthy amount of new root growth when I took it out of the nursery pot. Here are some of the other houseguests. Many of them would be perfectly fine outside—like the three agaves you see in the next photo (Agave victoria-reginae, Agave parviflora, Agave striata)—but I’m hoping that the preferential treatment I’m giving them will make them grow faster. 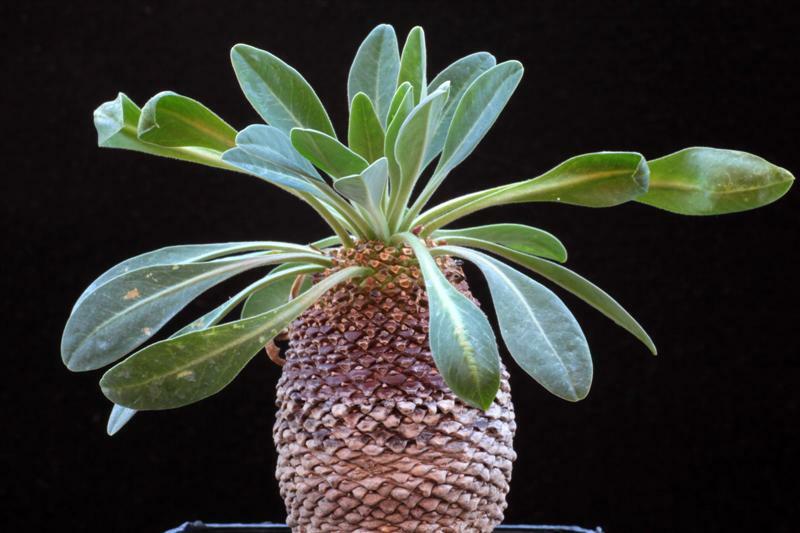 Euphorbia bupleurifolia. My goal is to get them to grow as quickly as possible since mature specimens are drop-dead gorgeous (check out this photo). Do you bring your special favorites inside for the winter? Frankly, I don't want to end up with too many plants inside. I find it a chore to water them because I have to be careful not to slosh water on the furniture, floor etc. But the desire to protect my favorites overrides any inconvenience. My next house is going to have lots of south-facing windows -- I'd love to have dozens of plants inside and growing during the winter. Right now most are in the dim, cold garage, semi-dormant or dormant. First photo on the far right: that's what my plumeria looks like, except it just dropped its last leaf. Keeping it in the warm basement to help prevent any rot this winter -- my last attempt at growing this. I'm with you re: plumerias. Mine is a souvenir I brought back from Maui (it was just a stick in a plastic bag). It had a nice head of leaves in the summer and fall, but as soon as it got colder, they all fell off. Now they're slowly growing back. You have some really nice plants growing inside. They are doing really well. I should do a post on mine. I think I might need some shade cloth on my window because the room gets really warm. I have to water all the time. I should probably water them more than I do. But I'm afraid of killing them by overwatering--it would be ironic if they died inside while under my care when they might have survived outside with no care :-).